The Sun provides the Earth with the heat and lighting necessary for life (1). Despite years of astronomical study, however, this yellow dwarf center of our solar system remains shrouded – both literally and figuratively (1). In fact, the naked human eye cannot even look at the surface of the Sun directly without inducing serious eye damage, as the Sun shines with a surface brightness 398,000 times greater than that of the Moon (2). The Sun’s surface is not only physically masked by radiative activity such as solar flares and storms, but also by gaps in knowledge regarding its activity and properties, such as the cause of and ability to predict solar flares. Scientists at the National Aeronautics and Space Administration (NASA) and other laboratories around the world have made significant progress in elucidating the Sun’s composition. The Sun contains several layers bound by an enormous force of gravity. These layers include an exterior region consisting of the corona, chromosphere, and photosphere, and an interior region consisting of the convective zone, tachocline, radiative zone, and core (3). What occurs within the nearly 700,000 kilometer radius of the Sun affects the brilliant activity that astronomers observe on a daily basis, as well as the energy, heat, and light that power our solar plants, warm our planet, and even influence our circadian rhythms (1, 3). The Visible Surface: What can we see? Although the human eye cannot directly observe the Sun, which is not only too bright but also nearly 150 million kilometers from the Earth, advances in technology continue to track activity at the solar surface. 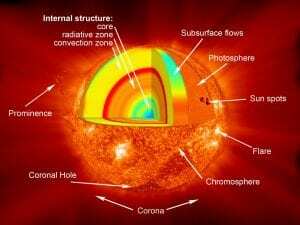 Scientists collect data and draw conclusions about the interior of the Sun through the study of solar surface activity. Most of the visible light observed without advanced technology comes from the photosphere, the outermost surface of the Sun, which emits solar radiation that travels to the earth in a mere eight minutes (1, 3). Trying to look at this layer without the right equipment would severely damage the human eye, however, humans can gaze upon the Sun directly during total solar eclipses when the moon masks the photosphere’s harsh light (1). The red and white rings characteristic of solar eclipses result from the normally faint visible light of the chromosphere and corona, which surround the outer photosphere (1). Normally, the corona and chromosphere reach 2,000,000 ºC, comparable to temperatures found in the convection zone of the Sun (1). Based on the ordering of the layers, one would expect the photosphere to be hotter than the corona and chromosphere but the temperature of the photosphere is actually lower than that of the corona and chromosphere. Due to a phenomenon known as coronal heating, the temperature initially increases with the distance from the Sun’s surface (1). Despite relatively low temperatures at the photosphere, the temperature at the surface of the Sun is still very high, comparable to that of the Earth’s core at around 5500 ºC (1). Cooler regions on the photosphere compose sunspots, darker patches on the Sun’s surface that scientists track to better understand the 11-year solar cycle responsible for solar flares, storms, and coronal mass ejections. However, the surface layers of the Sun alone do not reveal much more conclusive information than that discussed above. To investigate the magnetic or solar dynamo, which is key to understanding mechanisms behind the solar cycle and solar mysteries, scientists must search deeper in the Sun for answers. Under the photosphere, the Sun contains four distinct regions: the convection zone, tachocline, radiative zone, and core. Other than the tachocline, which does not undergo any known specific process, scientists differentiate between the inner regions of the Sun by the different processes that occur in each. Of these, the most important are convection in the convection zone, radiation in the radiative zone, and the photon-photon chain in the core. These processes facilitate the activity that researchers observe at the Sun’s surface. The convection zone spans the 200,000 kilometers immediately below the photosphere and constitutes the outermost 30 percent of the Sun’s interior (3). As the name suggests, the convection zone facilitates the heat transfer process: convection. In convection, hot material rises due to its lower density and then cools and sinks in conjunction with the ideal gas law, PV = nRT (4). Because the ideal gas law depends on temperature, the lower temperature at the Sun’s outer regions in comparison to the Sun’s fiery core affects the interior’s density, causing convection. Even at the high temperature of 2,000,000 ºC, certain heavier elements such as carbon and oxygen (not hydrogen or helium, which make up the bulk of the Sun) retain a greater number of electrons in the convection zone than they do at the core (3). This increased density better retains radiation and heat, insulating the convection zone and resulting in circular movement of magma due to heat transfer and convection cell formation (3). What occurs inside the Sun affects what can be seen at the surface. Convective processes manifest at the photosphere as granules (1,000 kilometers in width) and supergranules (35,000 kilometers in width) that encompass the majority of the Sun’s surface (3). Granules, which are transient, can move at supersonic speeds and constantly shift in pattern. They form as the hot fluid interior of the Sun pushes up to the surface, cools, and reenters the convection zone. On the other hand, supergranules move more slowly and last longer than granules as a result of their greater mass (3). Unlike granules, supergranules follow both convective movement and magnetic fields, allowing them to be observed on the surface of the Sun as a pattern known as “the chromospheric network” (3). A thin interface layer known as the tachocline lies underneath the convection zone, dividing it from the radiative zone. The tachocline is characterized by significant shifts in chemical composition, rotation rate, and other traits and, in spite of its small size, plays an important role in understanding the Sun (3). While scientists previously believed that magnetic fields arose from the convection zone, they now think that the ionized gases responsible for generating these fields rest within this thinner tachocline (3). The magnetic dynamo facilitates many observed solar phenomena, including the 11-year sunspot (or solar) cycle (also known as the heartbeat of the Sun), the tilt of certain sunspot groups, and the 22-year magnetic cycle, which includes a switch of the north and south poles (3). Unfortunately, this region remains shrouded in questions. Many astronomers, helioseismologists, and other scientists hope that they will unlock many mysteries of the Sun by creating a working model for the generation of the magnetic fields(3). Ultimately, understanding the dynamics of what we see on the Sun, from the movement of sunspots to the timing of solar flares, rests heavily on elucidating the dynamics of the tachocline itself. While some researchers believe that the magnetic dynamo rests in an interface layer, other research suggests slightly different models. In 2013, helioseismologists at Stanford University led by Junwei Zhao discovered that the convection within the Sun did not follow the expected pattern of movement (5). Instead, using NASA’s Helioseismic and Magnetic Imager (HMI) to study waves on the surface of the Sun, Zhao and his team observed two layers of circulation coined the double dynamo (5). Although the circulation of magma was previously thought to consist of one layer of convective motion from the equator to the poles of the Sun’s surface and back, the data suggests that there are in fact two layers of cycling. These two layers circulate from the solar surface to the middle of the convection zone and from the middle to the bottom of the convection zone (5). These findings may improve scientists’ understanding of processes caused by the magnetic dynamo in the Sun’s interior, such as solar flare formation and sunspots (5). In 2015, Valentina Zharkova and her team proposed a similar model to predict future solar cycles and found that it could do so with 97 percent accuracy. Using this model, they forecast that 25th and 26th upcoming solar cycles will be smaller in activity due to the out-of-sync nature of the double dynamo cycles (6). Zharkova calls this phenomenon a “Maunder minimum,” last seen 370 years prior during the Little Ice Age of 1645, which begs the question: Is another freeze coming our way (6)? Although the convection zone and tachocline hold interest for many scientists, the zone underneath – the radiative zone – represents what most people associate with the Sun: radiation, more specifically x-ray and ultraviolet radiation. Making up nearly 50 percent of the Sun’s interior, the radiative zone transports energy in the form of photons or light (3). Although photons travel at the speed of light, scientists estimate that a photon could take up to a million years to travel through the Sun’s radiative zone to the tachocline. Instead of following a straight path, photons bounce around within the radiative zone due to the immense density at its innermost regions (20 g/cm3) (3). As the temperature in the radiative zone drops, the density also drops to 0.2 g/cm3 at the interface of the radiative zone and tachocline. The photons can then travel to the surface of the Sun, from which they can reach the Earth within eight minutes (1, 3). The core of the Sun hosts the reactions that generate its energy. Known as the proton-proton chain, this three-step fusion process occurs readily in the extreme conditions of the core – a temperature of 15,000,000 ºC and a density of 150 g/cm3 – and cease at the core’s edges near the radiative zone due to reductions in temperature and density (3). The first reaction of the proton-proton chain involves the collision of two protons to form a deuterium (2H), positron (e+), and neutrino (ve). The second reaction consists of a proton colliding with deuterium to produce helium-3 (3He) and a gamma ray. In the third and final step, two helium-3s (3He) collide to produce a neutral helium nucleus (4He) and two protons. The whole proton-proton chain, also called nuclear fusion, is often written as 4p → 4He + 2e+ + 2ve (3). In the early 2000s, scientists finally unlocked the answer of the missing neutrinos. They discovered that, instead of one neutrino, there are actually three types of neutrinos: muon, tau, and electron (7). Although all neutrinos produced by the proton-proton chain are initially electron neutrinos, they can convert into muon and tau neutrinos while traveling to the earth. Unfortunately for scientists, at the time of this discovery the muon and tau neutrinos could not be detected (7). Despite attributing neutrinos detected on Earth to nuclear fusion in the Sun, scientists could not actually prove that these neutrinos were the product of the proton-proton chain until 2014 (8). This important confirmation occurred in the Laboratori Nazionali del Gran Sasso in Italy using an underground Borexino detector. Until the Borexino detector directly detected neutrinos from the proton-proton chain, the detected neutrinos stemmed only from secondary processes (8). For physicists and astronomers, this discovery opens up many new questions about particle physics and our understanding of energy generation within the Sun. Blinded by the flurry of solar activity at the photosphere alone, it is easy to overlook the intricacies of the energetic processes that occur within the Sun. The processes ensuing in the Sun’s interior regions, from brilliant solar flares to dark sunspots, cannot be seen with the naked eye. Because the Sun facilitates many necessary aspects of life on Earth, enhancing our understanding is crucial to our future survival. With continued research, scientists hope to augment their knowledge of particle physics and the mysteries of the neutrino and to create a working model for the solar dynamo. Armed with this information, they hope to improve their predictions of the Sun’s activity and its implications for life on Earth.